The Burke homeplace is located on highway 603 in Blackwater, Lee County, VA. It is right at the Scott County line. 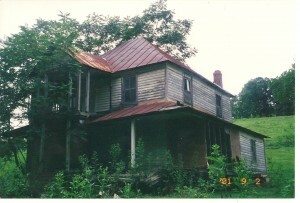 The house was built in the late 1800s by Robert and Polly Burke, my great, great grandparents. At least 3 generations of Burkes grew up in this house, including my great grandfather, Harrison Burke, and my grandmother, Nettie Mae (Burke) Baker. This picture was taken in September of 2001. My understanding is that is has been renovated since then and is in much better condition now. I will try to get a current picture uploaded at a later date. 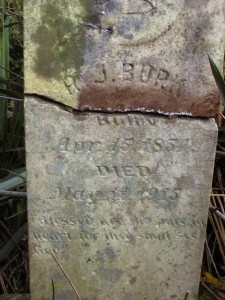 Below I have posted some pictures of the headstones of my family buried in the cemetery on the old Burke property. These pictures were taken by my uncle, David Baker, in September of 2001. Before you see the pictures, I have to share the humorous story of that visit. It was a warm day in September, and my uncle David had gotten permission by the current owners of the Burke property for us to go and take some pictures. He was working on his own genealogy website and did not have any pictures of the Burkes’ headstones. My dad and I went along with him. Being a Florida resident, I foolishly went in shorts, sandals, and a muscle shirt. The old house and cemetery were very overgrown, as the owners were using the property to graze their cattle. As we climbed up the hill to the cemetery, we had to cross a ditch that had barbed wire placed right at neck level. We entered the cemetery with David in the lead, dad in the center, and me bringing up the rear. As David starting taking pictures of headstones, dad doubled over and began to slap his legs, making a “Whoa! Whoa! Whoa, whoa, whoa!” sound. David and I stared at him, wondering if he was doing a war dance. Then, we began to feel the sharp stings, a couple at first, then several. We realized that dad had stepped on a yellowjackets’ nest and that we were being attacked. We ran out of the cemetery in reverse order of our entry, bending sideways so that the barbed wire would not decapitate us. We ran down the hill as fast as we could, slapping yellowjackets all the way and listening to David laughing till he was out of breath. Ironically, David received the least damage although he was the last one out. The next day, dad and I looked like we had both lost a fight. David laughed for days about the incident. Dad did not find it very amusing. 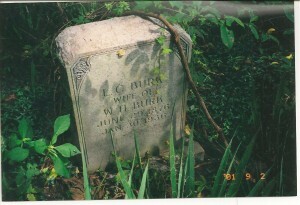 I am the granddaughter of James Oscar Burke, brother of William Harrison Burke. Great website! I am trying to find out about Robert J. Burke’s parents. 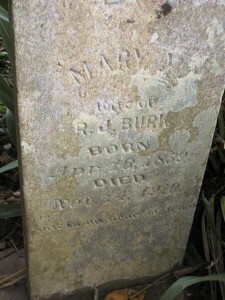 Was his mother Catherine Kitsey Burke, and was she the daughter of Josiah Burke born 1777 or 1780? Josiah was supposed to have died in 1816, but some geneologists believe he fathered more children after that date. He was married to one woman in 1806 and to Mary Polly Orr in 1815. The 1900 census says Catherine was widowed with two living children. She was lliving with her son, Alexander, in Sulphur Springs. Some people believe that Elizabeth Burke and Robert Burke are her two children born about ten years before Alexander and D. E. Burke, who were supposed to have been fathered by Abraham Skidmore. I cannot find out if Robert and Elizabeth are her children or who their father was. Please E-mail me if you have any information. Thanks. I enjoyed David’s and your website. My father [1924-2010] Jake Burke told me that Kitsey never married, he said she had 2 sons by a Skidmore man. I had my fathers y-dna and found out that it was from Abraham Skidmore/Jonesvile va/ky who by the way was actually a Bowman, oral history states that Abraham’s mother had a “discretion” and 2 of her sons did not belong to her husband, John Skidmore. I found out that Kitsey had other children as well, Robert being one and Elizabeth the other, there may be others as well. I am sure Catherine “Kitsey” Burke lived in Blackwater Va, however I have never been able to find her there in any census. I am not sure about Josiah being her father but it does sound feasible. If Kitsey’s mother married Alexander Orr in 1826, that would be the year Kitsey was born and Kitsey did name her son Alexander James Burke, so it appears she was a Burke and did not take the Orr surname. Sure wish I could find some proof somewhere. I’m a descendant of Alexander Burke and Louisa Patience Penley through their daughter Sarah Elizabeth Burke who married John T. McLain. Actually, I took these pictures. 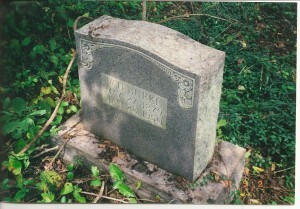 And furnished those of Robert Burk and Polly Mcpherson Burk, My Great-great grandparents. Apparently, Robert Burk’s mother is listed as K. Burk on his marriage record. No father listed. Hi John. I pulled these pictures off my uncle David’s website at https://www.genealogy.com/ftm/b/a/k/David-Baker-3/index.html I assumed that they were the ones he took when we visited the homeplace in 2001. Thank you for providing the pictures! Just stumbled onto your site, and I must say, what a fascinating site to me. The photography is so outstanding. At first I believed you were referring to Blackwater, the old Princess Anne County, (now defunct), Virginia. Now what was Princess Anne County, Virginia, is known as Virginia Beach, Virginia, as the county and the small city merged into one entity on January 1, 1963. I congratulate you for an outstanding site, as well as your photography within that site. Very deserving of some kind of award. Would love info on The family of Jemima”Gemima” Burk. She was married to George. W. Collinsworth. They are believed to have come from Lee County, Va. Any information would be appreciated.